Washington, D.C. – April 24, 2018 – SCORE, the nation’s largest network of volunteer, expert business mentors, has published original survey data on the state of U.S. women’s entrepreneurship in honor of the upcoming National Small Business Week. Data collected from 20,000 small business owners shows that women-owned businesses are equally as successful as men-owned businesses across all independent measures of business success, including business starts, revenue growth, job creation and number of years in business. Women are more likely than men to start businesses, with 47% of women in the pre-start or idea phase of business ownership following through on starting a business in the past year, compared to only 44% of men. Women-owned businesses reported nearly the same amounts of anticipated revenue growth in 2018. 57% of women entrepreneurs predicted an increase in revenue growth, while 15.5% predicted revenues would stay the same, and 9% predicted a decrease in revenues. In comparison, 59% of male entrepreneurs predicted an increase in revenue growth, while 15.5% predicted revenues would stay the same, and 9.5% predicted a decrease in revenues. Women were significantly more likely to launch service businesses. Female-led businesses were more likely to be in professional services, retail, healthcare (10% of women-owned businesses vs. 5% of men-owned businesses) and education (9% of women-owned businesses vs. 5% of men-owned businesses). Male-owned businesses were more likely to be in construction and manufacturing (12% of men-owned businesses vs. 4% of women-owned businesses). 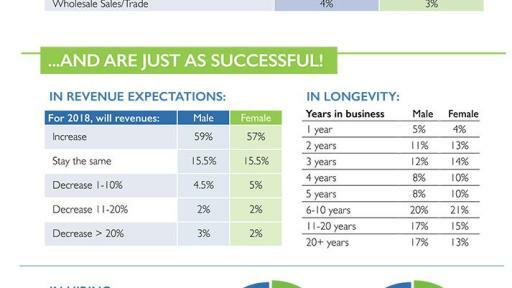 Both men and women-owned businesses had comparable longevity – with the exception of very established businesses. 17% of male respondents owned a business 20 years or older, compared to only 13% of female respondents. Women-owned businesses reported slightly lower levels of employee hiring, with 27% of women-owned businesses reporting an increase in hiring, compared to 30% of men-owned businesses. For more information, download the The Megaphone of Main Street: Report on Women’s Entrepreneurship and its accompanying infographic. This report constitutes the third installment of SCORE’s Megaphone of Main Street data report series, which presents original, statistically significant survey data on the American small business landscape. Survey data was collected from 20,000 small business owners in all 50 states and Washington, D.C., representing small businesses of varied sizes in a broad coverage of industries. Subsequent sections of this data report focus on the greater challenges that women entrepreneurs face in securing financing for their small businesses compared to men, and the positive impact of mentoring on small business success. Since 1964, SCORE has helped more than 10 million aspiring entrepreneurs. Each year, SCORE’s 10,000 volunteer business experts provide 350,000+ free small business mentoring sessions, workshops and educational services to clients in 300 chapters nationwide. In 2016, SCORE volunteers provided 2.2+ million hours to help create more than 55,000 small businesses and 130,000 jobs. For more information about starting or operating a small business, visit SCORE at www.score.org. Follow @SCOREMentors on Facebook, Instagram and Twitter for the latest small business news and updates.